tory of this section of the country, the above named gentleman holds a foremost place. He has done everything in his power to aid in the upbuilding of his community, where he resides twenty, township nineteen, range fourteen. Mr. Andersen was born in the village of Randler province of Jutland, Denmark, August 12, 1841, and was third of four children in the family of Andrew and Johanah (Nelson) Rasmusen, and following the custom of the Scandanavians, Mr. Andersen takes his last name from the father's given name. Our subject grew to early manhood his native land, and then came alone to America, crossing from Hamburg to Hartlepool, England, and embarked at Liverpool for Quebec. He came west to Galesburg, Illinois, in June of 1867, the trip from Quebec to the prairie state occupying seven days; a wreck two hours out of Quebec delayed them for some time, and incidentally gave Mr. Andersen a black eye. So slow was the schedule and so many were the delays that the immigrants often played ball at stations where they were on sidings. One man left in a town walked on to the next and overtook the train. Mr. Andersen remained in Illinois until the spring of 1869, employed at farm labor, and then went to Missouri, where he remained in Randolph and Johnson counties until coming to Valley county, Nebraska. Mr. Peter Mortensen, an old school friend of Mr. Andersen, joined him at Warrensburg, Missouri, in 1870; Christian Frey and Jeppe Smith came to Warrensburg in 1871, becoming acquainted with Andersen and Mortensen; Mr. Andersen also had the acquaintance of George Moller. The five men decided to go to some other locality in partnership; Andersen and Mortensen wanted to settle in southern Missouri, and Frey, Smith and Moller voted to come to the North Loup Valley in Nebraska. So in April, 1872, Niels Andersen, Peter Mortensen and Jeppe Smith left Missouri and came to Grand Island, Nebraska, where they purchased an outfit of two ox teams, one wagon, two breaking plows, and other necessary camp utensils. They cattle to the North Loup Valley by the way of Dannebrog and St. Paul in Howard county, making their first homestead location near the town of North Loup, but later on came to the locality northwest of Ord, where they made homestead location on section eight, township nineteen, range fourteen; Niels Andersen on the southwest quarter, Peter Mortensen on the northeast quarter and Jeppe Smith on the northwest quarter. George Moller, who had joined the party at North Loup was with them at the time they made homestead locations, and filed on the southeast quarter. Christian Frey, the fifth man of this original party, joined the others several weeks later on, and took a homestead on the southeast quarter of section six. This made the party complete as originally organized in Warrensburg, Missouri; the oxen, plows, etc., had been purchased jointly and a joint dugout cabin was first put up on the Mortensen claim; these five men were known as the Danish colony. In the fall of 1872 they began to erect buildings on their separate claims, and the joint partnership heretofore existing was dissolved, and the men began life in their new home, each for himself. They were loyal friends to each other, giving and receiving assistance as needed. These men were the foundation builders of this part of Valley county, being joined by other venturesome homeseekers as the months rolled by. They came in here to a raw country, filled with many unknown dangers, and endured many privations. They also experienced some trouble from the Indians; every time one of them went to Grand Island they heard of their massacre by the redskins. They suffered through the following years of grasshoppers, drouth, wind, hail and prairie fires, but all lived to see Valley county become a prosperous country. Of these five men, Niels Andersen, Peter Mortensen, and Christian Frey remain, honored citizens of Valley county. To go back a little in history, it might be said that Falle Miller made the sixth man of this party, as he came along in June of the same year and joined this little Danish colony. Niels Andersen was married to Hannah Mortensen, sister of Peter Mortensen, by Elder Babcock, in Valley county, July 8, 1873. Miss Mortensen cattle to America in 1872 from Denmark. Mr. and Mrs. Andersen have had eight children, six of whom are living: Hannah, wife of Elbert Hollister, lives in Oregon; Morton, who resides in Idaho; Christina, who is the wife of Albert Oleson, has one child and lives at Cedar Bluffs, Nebraska; Peter, Jennie, who is married to Chris Hansen, and Annie, wife of Charles Lickly, who has one child and resides in Valley county. Mr. Andersen and family are one of the pioneer families of Valley county, enjoying the respect and esteem of a large circle of friends. Mr. Andersen's first residence in Nebraska was a log house built of the trunks of small willows; to this he later built an addition and resided there until 1883, when he moved to his present home on his timber claim a mile south, in section twenty, where he has one hundred and sixty-two acres, part of which is more like a park than a farm. He owns a fractional half section on Haskell creek, part of which is used as a farm and part as a stock ranch. A view of Mr. Andersen's home place, together with a sketch of his original log cabin will be found on another page. "Box Elder Grove," Residence of Niels Andersen. out Madison county as a progressive and successful agriculturist, and is highly esteemed by all with whom he has had to do. Herman Wachter is a native of Germany, his birth occurring in the province of Prussia, in the year 1838, and is a son of August and Christine Wachter. Our subject with his parents left their native land for America in 1854, of which country they had heard very good accounts, and came here to acquire cheap land; they left Hamburg on a sail boat and were eight weeks on the sea, and after landing in New York, they immediately started for the west, locating in Wisconsin, where they remained twelve years. In 1866, Mr. Wachter started for the far west as Nebraska was called in those days, coming by ox team, and was on the road six weeks. They came to Madison county, Nebraska, where our subject took up a homestead claim, and on this land built a log house, in which the family lived four years. In those very earliest days of settlement on the western frontier, many hardships and privations were endured, and during the first few years of cultivation, the grasshoppers devastated that region, destroying all the crops for miles around, which made it very hard for the new settler of that section of the country; prairie fires were almost continuously fought, many times our subject and family having to fight them to save their lives and property; and deer and antelope were plentiful in those days, and could frequently be seen in large herds. Mr. Wachter was united in marriage in 1861 to Miss Henrietta Kratke and Mr. and Mrs. Wachter are the parents of the following named children: Louise, Minnie, Amelia, Mary, Martha, Herman, Fred Ferdinand and Emil. Mr. and Mrs. Wachter and family live in their pleasant home, and are surrounded by a host of kind and loving neighbors, and have the respect and esteem of all who know them, and their friends are many. Charles A. Sorensen, numbered among the well known pioneers of Howard county, Nebraska, has built up a fine farm in Dannebrog precinct, where, until his removal to Billingham, Washington, he was comfortably situated and surrounded by a host of friends and all the comforts of life. Mr. Sorensen was born in Waukesha county, Wisconsin, May 5, 1848, and is a son of Christian and Anna Sorensen, who raised a family of seven children, of whom Charles was the eldest. A sketch of Louis H. Sorensen, a brother of our subject, appears in this book on another page. When Charles was eighteen years of age, he left home and started in business for himself. In the spring of 1872, he came to Howard county, and settled on a farm, and has made this region his home since that time. For the past number of years he occupied his father's original homestead, located on section eight, township thirteen, range eleven. The father, with another son, and one, daughter, are now deceased, while the balance of the family reside in Howard county, excepting one brother, who makes his home in Minnesota, and another in the eastern part of Nebraska. At different times since locating here, also prior to that time, Mr. Sorensen has traveled extensively, visiting a great, many states in the Union, and while he has been favorably impressed with some parts, has found that Nebraska can hold her own in every instance. He has been very successful in his farming and business operations, and was recognized as a leading citizen and active, public-spirited gentleman. Mr. Sorensen was married at Dannebrog on February 9, 1898, to Miss Elinor Bailey, and they have one child, Edna. Among the public officials of Valley county, none are more prominent or hold the confidence of the people to a greater extent than William A. Prentice, who is serving at present as county assessor. His faithful discharge of all duties, his perfect sense of justice, and his upright character and public spirit have placed him among the most highly esteemed men of this section. He has been a resident of the county for many years and possesses a large circle of acquaintances. His home is in North Loup and he is devoted to the interests of the community. Mr. Prentice was born in Waushara county, Wisconsin, on July 6, 1851, the youngest of nine children born to Allen and Elizabeth (Babcock) Prentice, and is the only one of the family now living. The father died in Wisconsin on January 9, 1872, while the mother died in New York state on the 20th of April, 1892. Mr. Prentice grew up on the farm in Wisconsin and attended the local district schools, obtaining his education there. Later on he taught for several terms. On January 18, 1872, Mr. Prentice was married to Miss Callie Babcock, a native of New York state, and also a teacher. She is a daughter of Henry and Angeline (Langworthy) Babcock. In the spring following, Mr. Prentice, with his wife and child, came to Valley county, Nebraska, where he filed on a homestead of one hundred and sixty acres in section four, township seventeen, range thirteen. The family lived here for five years and then moved into North Loup, where a comfortable, cozy home was built. Since that time this has been the family home, and Mr. Prentice has been engaged in his trade, that of carpentry. 1891. He has also served as director of school district number three. Four children have been born to Mr. and Mrs. Prentice: Angeline, now Mrs. John J. Abbey, is now living in North Loup; Asa L. is now married and resides in Elba, Nebraska; Henry L., also married, is a resident of North Loup; and Elaine, the youngest, now Mrs. G. G. Boehler, is also a resident of North Loup. One of Mr. Prentice's brothers, Asa B., was pastor of the Seventh Day Baptist church in Center, New York, for over thirty-three years, and in April, 1902, was called to the pastorate of the North Loup church of that denomination. He died on the 24th of May, 1904, at this place. Another brother, Nathan B., who served through the civil war as quartermaster of the Thirty-seventh Wisconsin Infantry and afterwards served for thirty years in the United States pension bureau at Washington, died in 1906 and was buried in Arlington. Mr. and Mrs. Prentice have passed through all the trying years of pioneer settlement and have played an important part in the development of the community. They have been faithful church workers ever since coming to the state. A history of that portion of the state of Nebraska in which Madison county is located, would be incomplete without including a sketch of the above named gentleman, Austin L. Carter, who is one of the most prominent of the old settlers, and has always done his full share toward the growth and development of his state and county. Mr. Carter resides on section twenty-six, township twenty-four, range one, in his pleasant home, where he and his family are surrounded by a host of good neighbors and friends. Mr. Carter is a native of Coles county, Illinois, his birth occurring September 1, 1847; he is a son of Benjamin and Susie (Keiger) Carter, the father being born in 1809 in Ohio, but of English descent. The Carter family settled in Kentucky at a very early date, Carter county of that state taking its name from this family. Our subject's mother was a native of Virginia, born in 1812; her grandfather served in the revolutionary war, and her father in the war of 1812. In 1869 our subject moved to Cherokee county, Kansas, where he remained twelve years, until 1881, then, came to Indiana, living there two years. While a resident of Kansas, Mr, Carter was married, and upon moving to Indiana his wife and family came with him. In 1883 they came to Madison county, Nebraska, where they bought their present home of one hundred and sixty acres of land, known as the Brosh homestead. Mr. Carter has greatly improved the land, and now has four beautiful houses on his place. Mr. Carter is interested in the raising of thoroughbred Poland China hogs, of which he has quite a number. Mr. Carter was united in marriage February 21, 1875, to Miss Nina Giger, a native of Michigan, and a daughter of John and Sarah Giger. Mr. and Mrs. Carter are the parents of two children, Roy and Susie. Mr. and Mrs. Carter and family are highly esteemed by all who know them, enjoying the good will of a host of friends and acquaintances. Mr. Carter is counted one of the substantial citizens of his community, and has been a resident of Madison county for twenty-eight years or more. He is a republican, and a member of the Fraternal Order of Eagles. John J. Joyner is one of Custer county's earliest settlers and has passed through many periods of Nebraska history. He has always been interested in everything pertaining to public welfare and prosperity and is one of the best known men in the county. Mr. Joyner was born in Solon, New York, November 15, 1835, next to the eldest child of James and Henrietta (Tanner) Joyner, natives of New England. The father served in the civil war in the One Hundred Fifty-seventh New York Infantry and died in New York. The mother also died in that state, in 1847. They were parents of six children and besides John J., there is but one member of the family now surviving, Mrs. Hannah Polson, of Cheboygan, Michigan. Mr. Joyner grew to manhood's estate on the farm in New York, receiving his education in the local schools, and as a young man engaged in farming. Later he learned the trade of wagon maker, and on May 26, 1857, was married in Whitney's Point, New York, to Miss Dorcas D. Cole, also a native of that state, and they made their first home at Cortland, New York, where he worked at his trade of wagon maker. Her father, Newell Cole, was a native of Rhode Island, and died in Cortland county, New York, in the sixties. Her mother, whose maiden name was Susan Potter, was born in New York and died in Cortland county, about the same time as the father. Mrs. Joyner has two sisters living in New York. second lieutenant for his gallant service. His father and two brothers, James E. and Robert E., also served in the Union army. At the close of the war John J. Joyner returned to his home in Cortland county, and there resumed work at his trade, in the town of Cincinnatus. In the spring of 1880 Mr. Joyner came to Custer county, looking for a location for a homestead, and filed a claim on the northeast quarter of section thirty-two, township eighteen, range twenty-two, and a timber claim adjoining of the same size. He returned to New York and returned with his family as far as St. Paul, Nebraska, in the fall of 1880, moving to the homestead with them the following spring. They made this place their home, improving and developing it, until February, 1906, when they sold their interests there and moved to the town of Merna, erecting a fine modern residence where they now live. In an early day Mr. Joyner was instrumental in organizing school district number fifty-four, and served as treasurer of same for several years, his son Grove, being its first teacher. He also served six years as justice of the peace. He and his wife have had two children, Denton V., married and living in Broken Bow, has two children, and a sketch of him appears in this work, and Grove O., married and living in Broken Bow, has two children. The family are prominent in social and educational, as well as various other circles, and have a high standing in the community, enjoying the esteem and regard of a large circle of friends. One of the leading old settlers of Pierce county, Nebraska, who has aided materially in the development and growth of this section, is the gentleman whose name heads this review. He has experienced all the hards [sic] times that fell to the lot of the pioneers in Nebraska, suffering much loss and deprivation, and is glad that the time has come when these things are changed and the people of this section can live in peace and plenty and enjoy the fruits of their hard labors. Mr. Stark was born in the village of Altschlage, province of Pommerania, Germany, November 24, 1839, and is the son of Fred Stark; who was horn in 1799, and Christina (Doege) Stark, who was horn in 1799. He sailed for America at Bremen, October 3, 1867, on the sailship "Johanna Maria," the voyage lasting two months. He landed in New York, and settled in Rock county, Wisconsin, in February, 1863, where he worked at farm labor four years, and from there moved to Dodge county, Nebraska, where he took up a homestead near Crowell, and lived eight years - six years in a sod house, building a frame house in 1878. In 1880 he settled in Pierce county, and took up it pre-emption claim, upon which he first built a sod house, and ten years later a frame house. Our subject came from Wisconsin to Dodge county, Nebraska, by team, and traded horses for oxen when times were hard. In those very early days he experienced his worst hardships and inconveniences. The grasshoppers took all his crops for the three years of 1873, 1874, and 1875, inclusive; and like many of the first settlers, our. subject burned hay for fuel; in those times, antelope, deer and elk were plentiful. The nearest market place was at Fremont, twenty-five miles away. Hail destroyed all crops one year, and after the drouth of 1894, Mr. Stark got but eight bushels of wheat off the whole farm. In 1872, Mr. Stark was married to Miss Alvina Zemke, a native of the village of Langenhagen, province of Pommerania, Germany, and to this union have been born eight children, whose names are as follows: August, Ida, Augusta, Amelia, William, Anna, Frank and Emma. Augusta, died in 1881, August in 1901, and William within the last few years. Our subject has always done his share as an old settler, and is held in high esteem in his community as a worthy citizen. He is a democrat in his political views, and in religious faith is a member of the German Lutheran church. John B. Branaman was born in Virginia, February 13, 1851, and was fifth of nine children in the family of David C. and Cynthia (Brady) Branaman, there being two sons and seven daughters. The Branaman family moved to Illinois about 1857, from whence they went to Adair county, Missouri, in 1859. The mother died on the Missouri farm about 1867; and after a period the father again married while residing in that state. In the spring of 1874, John B. Branaman came with his father, step-mother, and sister Ella, to Merrick county, Nebraska. The father homesteaded on section two, township twelve, range eight, where he resided until the time of his death, January 5, 1899. Two sisters of Mr. Branaman also came to Nebraska later on. Of the Branaman family now living, there is the subject of this sketch and sister, Mrs. Clara Gilbert, who live in Nebraska, and a sister, Mrs. T. J. Overstreet, who lives in California. John B, Branaman took up a homestead in Merrick county on the east half of south-east quarter of section twenty-eight, township thirteen, range eight, and this homestead was his residing place until January 1, 1911, when he rented the farm to his son David, and moved to Central City where he intends making his home. He has added to his land holdings until, he now has three hundred and twenty acres of choice land in his farm. On October 13, 1881, Mr. Branaman was joined in wedlock to Miss Mary E. Earhart who was a native of Brown county, Ohio. They married in Merrick county, Nebraska. Mr. and Mrs. Branaman have had four children, three of whom are living: David B., who is married and living on the old home place, has one child; Bertram, who is deceased; Cynthia Pearl, and John Harold, who reside at home. Mr. Branaman is a successful farmer and stock man, and his family have the advantages of the modern home and enjoy modern educational advantages. They are best known along educational and social lines. Among the progressive and energetic pioneers of Knox county who have contributed largely to the prosperity enjoyed in that vicinity, a high station is accorded the gentleman above named. John Huigens, descended from old Holland stock, has been a citizen of Nebraska since the spring of 1884. The first year he rented a farm four miles north of Creighton and then bought a relinquishment of a timber claim ten miles west of town; this he later changed to a homestead entry to which he secured title and made his residence until November, 1904. The first season he built a frame house, using up much of his means; then during the next four years there was a continual drouth and no crops. He suffered many deprivations and discomforts, but presisted [sic] in his efforts in spite of adverse circumstances and has now a creditable success. He owns four hundred and eighty acres of fine Knox county land and some $7,000 worth of town property including his own commodious dwelling built in 1904, a tenant house and several vacant building lots. Mr. Huigens was born in Henry, Marshall county, Illinois, June 15, 1862, and reared just across the line in Putnam county; here he lived engaged in farming until his migration to Nebraska. He is a son of Edward and Catherine (Thoemas) Huigens, the former a native of Holland who died when the son was but two years old; the mother, a native of Germany, lived until 1903. Mr. Huigens was married in Marshall county, Illinois, to Mary, daughter of Wymer and Helen (Smith) Fitzler. To Mr. and Mrs. Huigens eight children were born all of whom are living, they are: Barnard, who married Jeanette Wattine, is cashier in a bank at Herrick, South Dakota, where he owns a town residence and a quarter section of fine land near by; Edward, is a barber in Creighton, and Anna, Joseph, Margaret, Emily, Julia and Henry are under the parental roof, the five youngest ones attending the Catholic parochial school. When Mr. Huigens first settled in Knox county, the prairies were free from fences, one being able to drive miles in all directions without any obstructions. He saw three deer on the prairies after he came, but did not bring one of them down. Cornstalks and hay were their only fuel a part of the time, and provisions were scarce and hard to procure. During the blizzard of January 12, 1888, Mr. Huigens was at the house, and suffered nothing from the storm. His cattle that were out were grazing to the northwest, so drifted to the creek bottom and there they were found safe and sound when the storm abated; one small pig was all the storm cost him, while many neighbors lost their all. Hailstorms missed him, while nearby neighbors' trees were barked and killed and hailstones were driven in the windows of one side of the house and out through the opposite ones. Mr. Huigens is independent in politics voting for the man he considers best, regardless of party. With his family he is a devout adherent to the Catholic faith; he is a member of the Modern Woodmen of America, and with his wife of the Royal Neighbors. After years of hardship and toil fortune has smiled on Mr. Huigens and leaves him still hale and hearty with a competency, and retired from any further toil of active life. In compiling a list of the representative farmers of Stanton county, Nebraska, a prominent place is accorded the name of Oliver Asplin, the owner of a fine farm located in section eight, township twenty-four, range two. Mr. Asplin is one of the pioneers of the county, and has been engaged in agricultural pursuits here for many years past. Mr. Asplin was born in 1850, and is a native of Nortlich, Sweden, the son of Olaf and Margaret (Olson) Asplin. He received his education in the schools of his native land, and spent his childhood and youth there. When our subject was just of age, the family decided to emigrate to America. They crossed the ocean in a sailing vessel, and after reaching New York, came direct to Staunton (sic) county, Nebraska. They at once took up the homestead where the subscriber now lives, which has been the home of the family ever since that time. A substantial but small sod house was their first dwelling house, to be replaced later by a good frame house. Many improvements have been made from time to time, until now Mr. Asplin is the proprietor of as fine a farm as one would wish to see. One of the most valuable parts of the farm now is a six-acre orchard which was planted by the subscriber some years ago. cident to a pioneer's life. He had faith in the country, however, and remained with it, and now is enjoying happily his share of the prosperity which is evident everywhere in this section. In 1875, Mr. Asplin was united in marriage to Miss Margaret Pherson, and six children have blessed this union. They are named as follows: Carl, Adolph, Barnard, Annie, Mable and Emma. William Coutts, one of the oldest pioneers of Antelope county, Nebraska, is a man of wide experience in agricultural pursuits and has a thorough knowledge of his calling. Mr. Coutts has been a resident of his present location for the past thirty years, and during that time has acquired an extensive acquaintance. He is highly esteemed and respected for his true worth of character by all who know him. Mr. Coutts is a native of Scotland, being born in Aberdeenshire, April 15, 1852, and is the son of William and Annie (Collie) Coutts, the father dying when our subject was but five years of age. Our subject's father followed the occupation of farming until about thirty-two years of age when he entered the employ of a railroad. Our subject received his education in Scotland and remained there until 1873. In that year he left his native land, going from Glasgow to Londonderry, where he embarked for America. After a twelve day voyage on the steamship "Hibernia," he landed in Portland, Maine. From there he went to Kent county, Canada, where he remained seven years. In 1880 Mr. Coutts came to Antelope county, Nebraska, and took up a claim in section thirty-five, township twenty-seven, range six, which is his present residing place. At first he built a shanty, but later he erected a good house, in which the family now live. In the early days, our subject had a hard time to get started in the new country, as did many others of those brave hearted pioneers of the west. On August 27, 1886, Mr. Coutts was united in holy wedlock to Miss Katie McCloud. Mr. and Mrs. Coutts are the parents of nine children, whose names are as follows: Colin, Verna (deceased), Josie, Minnie, Elizabeth, Georgia, Hazen, Hazel (deceased), and Gertie. Colin married Lou Tessier; they live at Crookston, Nebraska. Mrs. Coutts is a native of Canada, as was also her mother. Her father was a native of Scotland. Mr. Coutts is a member of the Modern Woodmen of America, and of the Ancient Order of United Workmen. In politics lie, is a republican and in religion a Presbyterian. Mr. and Mrs. Coutts and family are known by hosts of people in this part of the state, and in their thirty years' residence in Antelope county, have proved themselves worthy of the high esteem in which they are held. William J. Wilson is one of the earlier settlers of Custer county and has passed through many stages of the history of his part of Nebraska. He is a prosperous and successful man of affairs, owning a well equipped stock and grain farm and desirable property in the city of Broken Bow. He is interested in everything pertaining to the welfare and progress of county and state, and is recognized as a representative, upright citizen. Mr. Wilson belongs to a family that is well known in Custer county and was brought there in childhood by his parents. He is a native of Madison county, Iowa, born October 27, 1877, eldest of the three living children of John O. and Nancy (Kennedy) Wilson. A sketch of his father appears in this work. The family came to Custer county, and located there on a farm, where William J., reached maturity. After receiving a public school education he engaged in farming on his own account, and eventually purchased one hundred and sixty acres of land on West Table. Mr. Wilson was married at the home of the bride's parents, January 1, 1902, to Miss Anna Hebble, of West Table, who was born in Des Moines, Iowa, and came with her family to Custer county in 1899. Her father, Detlef Hebble, was born in Germany and came to the United States in early manhood, being now a resident of Texas. His wife, Caroline (Mill) Hebble, was also a native of Germany, and died in Des Moines in 1889. Mrs. Wilson has a brother in Texas, and two sisters, Mrs. George Kennedy and Mrs. Curtis Benger, in Custer county. After marriage Mr. and Mrs. Wilson located on his farm, where they resided until 1905, when he retired from active life and came to Broken Bow. Since coming to the city Mr. Wilson has engaged in contracting and building, and has been successful in this line of work. He is all energetic and able business man and has well earned the success he now enjoys. He has added to his farm and it now contains two hundred acres of good farm land, highly improved and well adapted to raising stock and grain. Three children have been born to Mr. and Mrs. Wilson: Lloyd L., Cleon D. and William G., all at home. one of the solid, substantial citizens of the central part of the state. He and his immediate family have been widely known for their progressive activity along the lines of education and similar public movements and have stood for the best interests of the community where they have lived. Mr. Delano was born in Oakland county, Michigan, April 13, 1859, third of the five children of Mortimer and Rosetta (Stevens) Delano. The father, who came to Oxford township, Oakland county, Michigan, about 1840, was a poineer [sic] of that township. He was a native of Genesee County, New York, born May 14, 1823; his death occurred on the Delano farm in Custer county, Nebraska, in August, 1898. His wife, also a native of New York, was born August 30, 1825, and her death occurred in 1896, while on a visit with her husband to the old Michigan home. Those of their children now surviving are: Will S., living in Custer county, Nebraska, a sketch of whom appears in this work; Milton, of Flint, Michigan; Adelia, wife of Henry Ward Bristol, of Roswell, New Mexico; and Fred, subject of this sketch. Mr. Delano was reared on a farm and remained with his parents until coining to Cherry county, Nebraska, in the fall of 1886. He had received the usual common school education given a farmer's son and was a graduate of the Michigan agricultural college at Lansing. He was well prepared for a life of farming and possessed ability to succeed in this line of work. Upon coming to Cherry county he secured a homestead there and in December, 1888, returned to Oakland county, Michigan, where March 27, 1889, he married Miss Rose Shoemaker, daughter of Calvin and Mary (Cole) Shoemaker; the maternal grandfather was the Reverend Thomas Cole. A week after their marriage, the young couple. came to their homestead, remaining there until December of the same year, proved up on the claim, and then came to Custer county and made their home on the old Delano farm where his father lived. In 1895 they located on the southeast quarter of section twenty-five, township seventeen, range seventeen, which they later purchased, and which has since been their home. Upon first locating there they lived in a "soddy," but now they have a fine, new modern country home, fitted with a furnace and a private gas plant, as well as many other conveniences and comforts. It is with pleasure we present a view of this elegant, well furnished country home, and substantial outbuildings, on another page of this work. This commodious home compares very favorably with the one in which they began housekeeping on this place, and they now own one of the best equipped grain and stock farms in their section of the state. Mr. and Mrs. Delano have two children, Harry Calvin and Lois Elsie. The former graduated from the state university farm school in the class of 1911, and the latter in the class of 1912. Mr. Delano's father, mother and brother Milton came to Custer county, Nebraska, in the spring of 1889, and the parents continued to make their home there until their deaths. 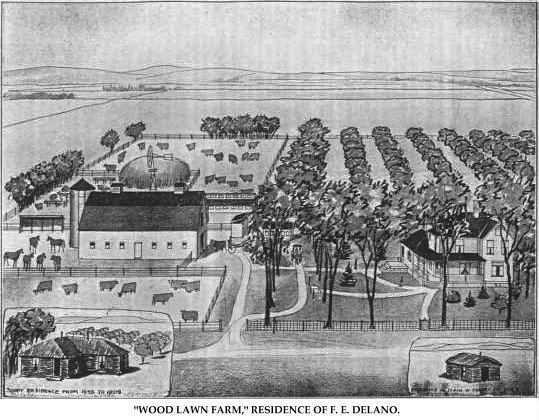 The elder Delano organized the Farmers' Club in June, 1889, under the trees of the place which Fred E. owns, and the club has had a continuous existence since that date. Before the new house was completed, Mrs Delano entertained seventy members of the club in their three-room "soddy," and all had a most enjoyable time. Mrs. Delano's parents are also both deceased. Her mother died in Michigan in 1871, and her father died in 1910, being in his eighty-third year. She has two brothers and a sister residing in Michigan. In reaching their Cherry county homestead, Mr. and Mrs. Delano encountered the spring floods; in many places on the road from Thedford to their claim the hay flats were under water. Here in the sand hills Mrs. Delano had one of the finest flower and vegetable gardens ever known in that region. A pet deer they owned, made itself very much at home in these gardens, eating their crop of cabbage at one time. The contrast of the soddy and the treeless billows of sand in this region was in strong contrast with the old settled state of Michigan in which the bride had been reared, but she soon became accustomed to pioneer surroundings, and has done her share cheerfully in building their fortune and keeping their beautiful new modern home. Mrs. Delano is a member of the Congregational church of Arcadia. Mr. Delano affiliates with the Modern Brotherhood of America, and in politics is a progressive republican. He has served a number of years as township official, and was also for many years director of the school board of district number eleven. William Luebke, an honest and industrious citizen of Pierce, carries on a good business as a blacksmith and wagonmaker at that place. He is owner of a comfortable home, and enjoys the respect of his fellow men, gained through strict integrity and sound business principles. Mr. Luebke is a sturdy son of Germany, born in the village of Fanger, district of Naugart, province of Pommerania, Prussia, October 18, 1861. He attended the parish school between the ages of six and fourteen, and the following three years was apprenticed to a blacksmith at Laksbeck, working for him two years as journeyman; at Stettin, nine months, two years at Friederichsgnade, and about one month at Berlin. He was employed as a blacksmith during his time in the army.